La maison est située dans le centre historique de Spello, dans l'enceinte médiévale de la ville, juste après la porte d'entrée principale de la ville, Porta Consolare. Toutes les commodités sont à distance de marche (gare, arrêts de bus, épicerie, poste, mairie, restaurants, bar, café, laverie, pharmacie et assistance médicale). Des places de parking sont disponibles juste devant la maison (paiement requis, gratuit la nuit). Un parking gratuit est à seulement 3 minutes à pied. La maison est très spacieuse et accueillante, idéale pour une famille de 6 ou deux couples. Toutes les chambres peuvent facilement accueillir des berceaux ou un lit pour petit enfant si nécessaire. La cuisine est entièrement équipée avec un comptoir en travertin et de nouveaux appareils. Les deux salles de bains sont équipées d'un lavabo, d'un bidet, de toilettes et d'une douche. Mots-clés: Entièrement rénové en 2009, la maison se développe sur trois étages pour un total d'environ 1200 pieds carrés. Contrairement aux autres hébergements, souvent conçus dans le but de créer le plus grand nombre possible d’unités d’hébergement touristique, notre objectif était de créer un lieu où notre famille puisse séjourner plus longtemps. c'est quelque chose que nous appelons la maison. The property is in the perfect location for visiting Spello. So spacious inside, 5 of us stayed there and there was plenty of room.Decorated beautifully and immaculate. Kitchen well stocked with plenty of cutlery and crockery. Good Wi fi connection as well. Highly recommend this property for anyone wanting to visit Spello. Highly Recommended in one of our favorite Umbrian locations! We had a great rental experience in Spello last year but the same location was not available for this stay. The location of this apartment is great and easy to access all of Spello. We parked just outside the village and were able to walk everywhere. Desiree was super responsive to all communication and made check-in and check-out very easy. The apartment was very well equipped (kitchen, tech items, air conditioning, washer/dryer etc). We didn't look for anything that wasn't there. We happily ended up there during the Infiorata Festival which was amazing. The apartment is in the action and overlooks the pathway. Spello is the perfect size village. It has that small town feeling but is large enough that there are great shops and numerous very good restaurants. A short drive to Assisi and other local towns that are fun to visit. I would certainly recommend this location to stay and you can't go wrong with Spello. Wonderful extended stay in Spello! We used Spello and this lovely house as a base for touring Umbria for three weeks in May. The house was wonderful, just as pictured in the description. It was immaculately clean, which is a top priority for us. We enjoyed walking to the piazza in the morning for cappuccino and brioche, relaxing and people watching. There is a small fruit and vegetable market just a few minutes from the house. We visited here quite often since the produce was delicious! Parking is outside the town walls, but only a five minute walk from the house. Desiree was extremely prompt in repsonding to any questions we had. Spello, a beautiful town, was conveniently located to visit other Umbrian hill towns, which we did almost everyday. The train is walkable from the house, if you desire to travel by train instead of car. We would definitely recommend this house in Spello to others, and hope we can return one day. We visited Spello a year earlier and found Spello, nearby towns (like Montefalco, Bevagna, and Assisi) and the surrounding landscape (olive trees, vineyards, rolling hills) wonderful. Returning home, we decided to rent a place in Spello the following year and looked online at many options - from hotel rooms to homes for rent. We chose to rent "Our House in Spello," and it proved to be a very good choice. We highly recommend it to you. Although the house can accommodate additional people, we rented it for just the two of us. This gave us a master bedroom (which was thankfully air conditioned and extremely quiet), a second bedroom (also air conditioned, where we kept our suitcases and which we used as a dressing room), and the full use of the kitchen (also air conditioned), sitting area, and two bathrooms. Much better than any hotel room, and very reasonably priced! The house has a wonderful location in the town. There is a welcome basket of extra virgin olive oil, jams, and other goodies in the kitchen. There are also basic "provisions" in the house like soaps, shampoos, laundry detergent - making your arrival and stay that much easier. Everything works, and every room is immaculate. The kitchen appliances, kitchen drawers, cabinetry, silverware, and pots are absolutely spotless (which is not always the case with rentals). The bedrooms, bathrooms, floors, linens - all clean and cared for. use, an extremely quiet bedroom, a spacious kitchen, and the air conditioning that we needed in key rooms (because it was unseasonably warm in Umbria this June). The tiled, spiral stairs between each floor were manageable for us, but anyone considering renting this property should be aware that bringing suitcases up these stairs can be challenging, and going up and down the spiral stairs requires a certain level of fitness. All of our communications with Desiree - from start to finish - were a pleasure. Reasonable, informative, helpful, responsive, friendly, and honest. Check-in and check-out were super simple (the key was waiting for us in the lock-box at the front door on arrival, and we were told to just leave the key on the kitchen table when we departed). Altogether, a very good experience - and we recommend it to you! Great apartment in medieval hilltop town! Talk about great location to do short day trips around to see Umbria's beautiful hilltop towns. Great comfort too. A/C, tho didn't need it with the lovely thick walls to stay cool. Washer helped, full kitchen equipped with everything. Restaurants plentiful and the town itself lovely to explore. Parking is short walk away, but can drop off things right at apartment door, for short term plaid parking. Terrific atmosphere and ambience. Nice shops. Try the wines, terrific. Especially Montefalco reds. 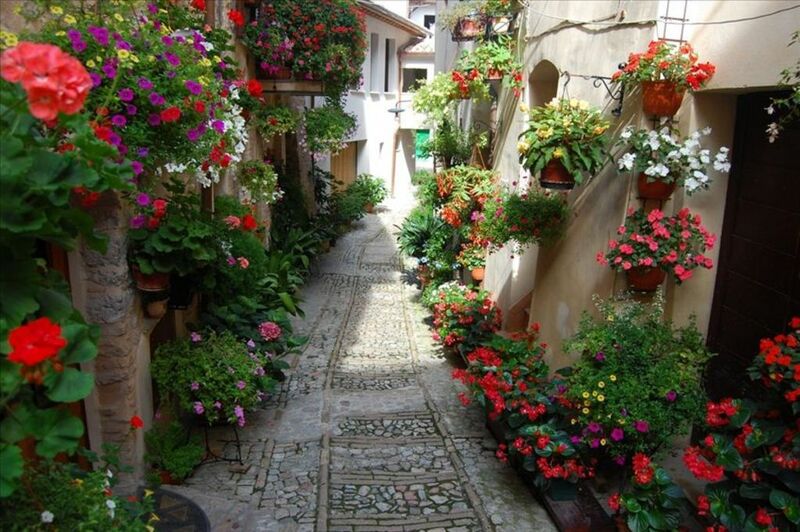 Spello is the perfect small town to relax while still enjoying everything about vacationing in Italy. The house is close to the train station, but easy parking for a car at the bottom of the hill. House is immaculate and owners will respond promptly if any concern arises. Two bedrooms and two bathrooms are hard to find --and ones that are modern but retain the old city charm. We love the house and town, visited 5 times now!